A nicely brine soaked goose seasoned with herbs, lemons and brown sugar was very tasty even though it took an unfortunate slide on the floor. Too many cognacs presumably. We were getting very merry at that point. Yes indeed, it is hard to clean up goose fat from wooden floors, but at least it was shiny for weeks after. 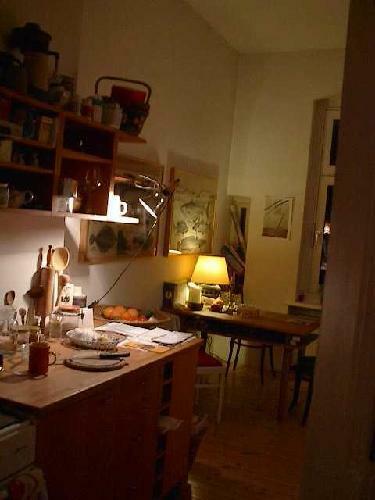 The kitchen in the flat I shared with my very good friend in Berlin. The very one in which I dropped the infamous Christmas goose! “Have another cognac!” suggested my roommate. She smiled refilling my glass.“Ja naturlich, warum nicht?” I replied even though we had just finished a bottle of rum throughout the lazy day along with her adult son. We had just returned from the wonderfully relaxing yet invigorating experience of a sweat lodge with friends the morning before. We were all in high spirits especially so as this was the first time she had seen her son in over a year, and within months he was going to Australia to finish his last year at university. Two days prior he had called announcing his plan to visit, stating he wished a traditional Christmas although for ourselves personally, I didn’t celebrate and she had not mood to. In fact, we had decided to go out trance dancing instead. Suffice to say, she was both irritated and pleased at the same time. In order to accommodate him, we had immediately erupted into a flurry of activity since shops would be closing early, fresh meats all bought up, the odds and ends of decoration all picked over.I had fought shoulder to shoulder crowds at Kaiser’s to purchase the last fresh goose to be found. With six canvas shopping bags full of lemons, oranges, spices and vegetables, my prized goose, and two backpacks of beer and wine strapped on, flushed with triumph I had sat on a train headed for Bundesplatz, panting softly from my exertions…. Now, on the evening I’d wished to be brilliant, I stood looking down in horror at the catastrophic mess I had just made on the floor while smoke billowed up and the oven fires sizzled with goose fat. Rocking to “System of a Down”, sloshing around a combination of rum, cognac, and a Holstein’s Dark, I had leaned down to check the bird. Forgetting the over rack had always been precariously perched on it grooves, I had attempted to pull it out of the oven. Boom! “It tried to get out of the oven! !” I cried. But we were both laughing so hard we could barely stand upright. 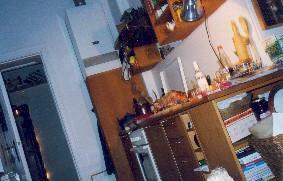 The high ceilings of the flat were roiling with smoke, grease had covered the entire stove and refrigerator area and still it hadn’t occurred to me to get it up yet. I did so belatedly, shoving the goose god back on his throne, the vegetables back around his feet and adding more marinate that I had thankfully saved in retrospect. “But they always find out anyway,” I reminded him, running to open all the windows to the freezing air and blowing sleet, while he grabbed all the kitchen towels to be had, wiping up the grease, coughing a little from the smoke between giggles. “I don’t think you need any more drink,” he said thoughtfully once I had returned to the disaster site. “Oh wait, on second thought….yes, you do!” We fell to laughing again and had another drink for good measure! Now for the cleaning efforts, as a child, along with my older sister, we had perfected cleaning anything in record time: the ability to make it look as if nothing had happened after the cataclysm has struck. Lots of soapy hot water, with cloths under hands and knees I buffed the floor. Robert burst out laughing again. No way to explain how the flat had suddenly become frigid, but the kitchen looked passably fine. The table was set, candles lit, the floor glistened suspiciously but at least it wasn’t slick anymore. “Go comb your hair, and stop laughing, you monster!” I pushed him towards the living room where he’d camped out. We just smiled at her. The Goose God was lovely, marinated to perfection having soaked for twelve hours in kosher salt, brown sugar, soya sauce, thyme, rosemary, lemons and black pepper. The vegetables tender and delicately tasting of the juices of the goose. The son and I shared conspiratory glances that might have worried his mother regarding other matters if I were not the person I am. A quirk of my personality regarding stupid blunders I commit: I almost always reveal them. It’s too funny to keep them to oneself. When she heard, she laughed and laughed along with us even though the prized goose has nearly escaped. It was a wonderful Christmas. Her son declared that we must eat every single bite of flesh from the bird or its half nibbled carcass would rise to haunt us through the night. We fully devoured it with relish….and more wine. Posted in Personal Entries, Photos. Tagged celebrations, christmas, goose, memoirs, memories.